1900 AUSTRIA 5 pcs of lithographic labels Comenius, Tyl + 3x woman. 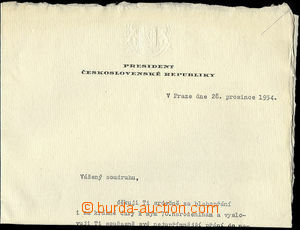 1954 ZÁPOTOCKÝ Anthony, signature president on/for acknowledgments arm.gen. A. Čepičkovi after/behind congratulation to birthday, double-sheet A4, hand-made paper, mark function and state. emblem in head, rare. 1988 16 pcs of stamp booklets from y. 1988 - 1990, any other one, mint never hinged. 1923 - 42 FOOTBALL comp. 5 pcs of Ppc with signatures Czechosl. sportovců: footballers i.a. Bican, kanoisté and other. 1942 MASARYKOVÁ Alice (1879–1966), daughter T. G. Masaryk, public functionary, letter from Alice Masaryková from USA to London on/for president E. Beneš, CDS White Plains 2.6.42. 1900 FRIČ Martin, Us Ppc with one's own signature, CDS Zdechovice 5/12 00. 1955 KUNDERA Milan, two-sheet with poems, signature and signed litografickou printings Jánuše Kubíčka. 1857 - 1936 debit notes comp. 3 pcs of, 1x Debit note of Saint Hostyn Foundation on/for 100 fl. from y 1896, Trieste 1857, debenture bond for 30.000CZK Czechosl. credit bank Prague. All stamped, good condition. 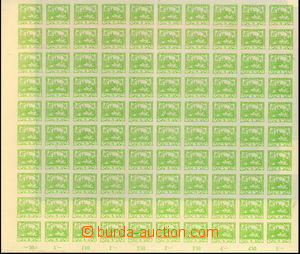 1900 AUSTRIA complete 12 pcs of set B.Fürth glossy, size 1/2, 1x torn. 1900 HUNGARY selection of 55 pcs of match labels from Slovak sirkáren as VELKÁ BYTČA, Bánská Bystrica, Ružomberok. Part duplication, various quality, on 2 cards A5. 1942 In memoriam Bohumil Heinz 1940, collection articles and memories supplemented with lot of gravures, issued Charles Kryl in Kroměříž, printing 120 copies/imprints. Superb condition. stockbooks A4 Pofis, 3 pcs, 16 black sheets, polstrované, used, good condition. 1918 cash paid dispatch-note with CDS Teplitz-Schönau 28.XII.18, on reverse fee paid provisional Postage due stamp 5h Crown with red transcription Porto, CDS Bruch in Bohemia 30.XII.18. good condition. 1918 Reg letter franked with. forerunner Austrian. stamp. 3x 15h Charles, CDS Libáň 16.XI.18, sent by pneumatic tube mail, print ordinal number date-stamp. good condition. 1918 - 19 4 pcs of entires, 2x letter franked with. 2 pcs of stamp. 10f Charles with CDS Liptótvár 918 Nov.8., postcard with 2 stamp. Reaper 5f with blue frame cancel. Zsolna Pályaudvar / 1919 Jan.6., card with Austrian stamp. 10h Crown and CDS Aussig 12.XII.18. 3h violet, corner piece with double print, Pof.2. 5h dark blue-green with big folded paper, Pof.4, hinged + stripped gum. 15h as blk-of-4 with 2 joined types bar and subtype bar, pos. 16 and 17 printing plate No.1, Pof.7STp. selection of 21 pcs of various stamps Hradčany with II. bar type, or subtype IIa, for example. 7F (with spiral type I. 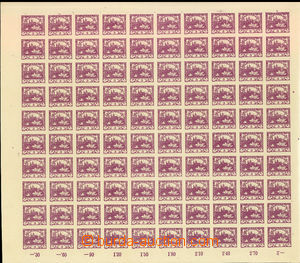 ), 11D, 11F, DL19a, SO5D, SO15, in addition 1x double strip with joined. spiral types, cat. ca. 1000CZK. comp. 6 pcs of stamp. with machine full offset, 1h double strip, 5h blue-green - partially double offset, 15h, 25h violet, 100h - incomplete offset. 10h + 20h + 25h right corner blocks of four with control-numbers, Pof.5, 8, 10.
selection of maculature prints in blocks and 12 pcs PLATE PROOF in original colors on/for ordinary maculature paper - values 1000h 3x, 20h 2x, 30h, 10h and 5h. Newspaper stamp 6h Mercure, L the bottom corner 10 block with plate mark VI in protective frame, Pof.64, superb. 2 pcs of PLATE PROOF overprints in/at corner blocks of four, A in red color, C in black color + corner blk-of-4 values 40h with overprint, Pof.170, exp. Gilbert. Pof.173A - 175A, types II. II. I., mint never hinged, exp. by Stupka., Karásek. 1925 Pof.199y, IV. type, with bands, wmk 5, exp. Gilbert. 1922 - 36 comp. 4 pcs of Ppc with postmarks as: Volosianka , slogan pmk Mukachevo - Postal stamps .., memorial Uzhhorod - Ethnical days, good condition. 1932 - 38 7 pcs Us Ppc with postmarks as: train post Jasiňa - Košice, Buštino, Rachov, Volovets etc.. 3x nice postcard Buštino, 2x Mukachevo. Without damage. 1937 whole newspaper wrapper franked 9 násobnou(!) franking stamp. 9h green Pigeon-issue, Pof.NV17, CDS Slaný 23.XI.37, recipient Prague. Without damage. Rare!